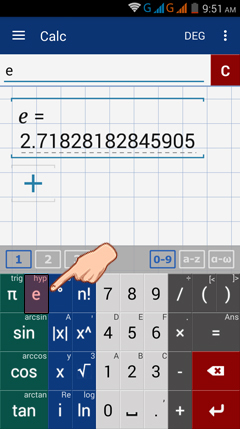 Use e to simplify expressions using e. The calculator displays e as a decimal value up to 14 decimal places as shown below. Enable hyperbolic functions by holding the e key. 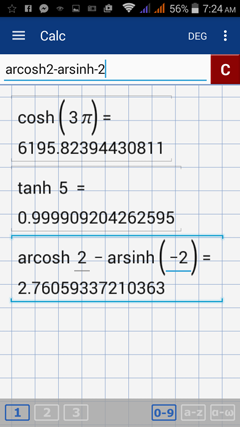 It will replace the trigonometric function keys (sin, cos, tan) with the hyperbolic function keys (sinh, cosh, tanh). 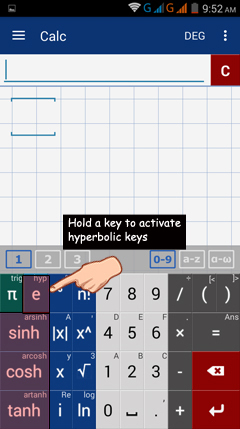 Enable the hyperbolic functions by holding the e key. Tap the sinh, cosh, and tanh keys twice to use their respective inverses. If the argument is longer than one term, enter it in parentheses. Hold the π key to switch back to trigonometric functions (sin, cos, tan). Type arccosh by tapping cosh twice. Type arcsinh by tapping sinh twice.